Sir Lesnar <+> [MU Online Fanz] <+> Official 3rd-party [MU Online] Fan Site & Game Guide! Sir Lesnar is the contact point for the Arka War mini-game and the Protector of Acheron mini-game. Speak with him to enter or register for the mini-games. 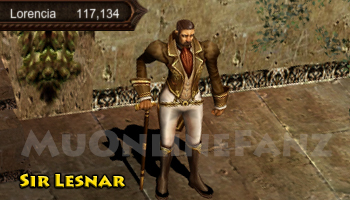 This NPC can be found in Lorencia (114, 131), Noria (183, 126), and Devias (240, 53). Option (1): He will tell you about Arca War. Option (4): Exchange any Trophies of War you've received. 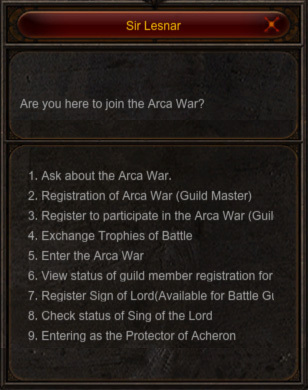 Option (5): Select this option to warp to the Arca War arena. Option (7): Use to register Sign of Lord for your guild. Option (8): Check the status of all guild's Sign of Lord registration. Option (9): Select this option to enter the Protector of Acheron mini-game.